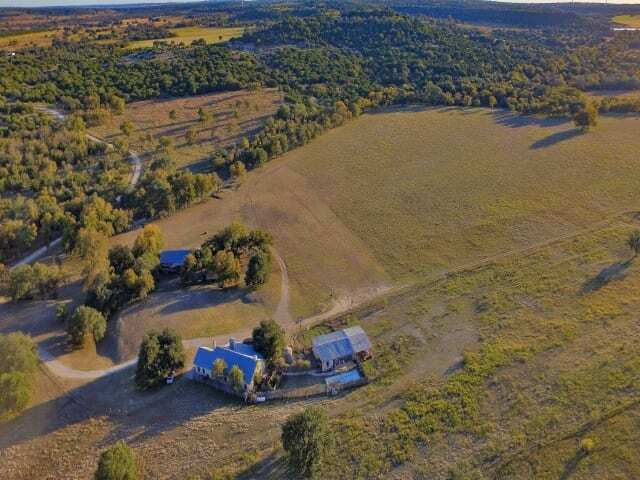 Summary: 490 +/- Acres — The Bootjack Ranch located approximately 10 miles east of Goldthwaite, Texas is truly a one-of-a-kind showplace. 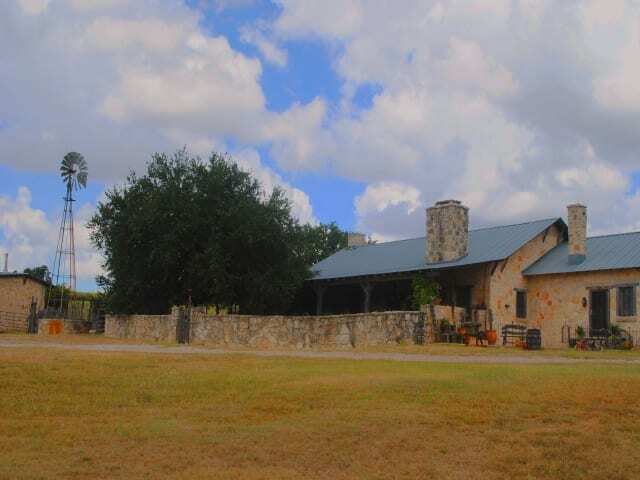 The centerpiece of the ranch is the Texas German style ranch home. The amenities were designed and constructed between 1994 and 2001 in a picturesque setting by the late world-renowned western artifact curator and Ralph Lauren associate, Tyler Beard. The home featured in Architectural Digest has impeccable craftsmanship that makes you feel as if the home was constructed 100 years ago. A large stone front porch overlooks a coastal Bermuda grass field that leads to tree-lined Simms Creek and the tree-covered hills. There is a second bedroom suite, a bunkhouse with three private guest suites and two hunters cabins. Hunt Texas whitetail deer, turkey and other native wildlife. Entertain your guests at the swimming pool and dance the night away at the Bootjack Dance Hall complete with a bandstand, bar, sitting area and pool table. The appointed western furnishings convey. Entrance — A cedar rail fencing with large succulent plants welcome you. Main Home — The 2,977 sq.ft. home overlooks the coastal field leading to Simms Creek. The home was constructed using 16″ thick Texas limestone walls, solid stone floors and hand-hewn timbers from a 150+ year old barn. The front of the home has a rock wall for privacy while still allowing you to watch wildlife from the front porch that runs the entire length of the house. Inside is an open concept living area with a large fireplace, dining area and kitchen with an antique-look stove, island and porcelain sink. The master suite is very spacious with large fireplace and over-sized sitting area. The bathroom has a sunken shower that could double as a sunken tub, a small fireplace, sitting area and weathered wood closets. The second bedroom suite has its own private entrance, a beautiful fireplace & full bath. Above the main home is an attic room ideal as an office or game room. This room is accessible by an outside stair entrance. A trellis-covered stone path leads you from the main house to the bunkhouse and swimming pool. Bunkhouse & Pool — The 1,242 sq.ft. bunkhouse has three private guest rooms each with their own bathroom. The bunkhouse opens to a large wooden deck overlooking an in-ground swimming pool. Outbuildings — The side of the bunkhouse has a covered hay storage area, an open workshop area, and a windmill. Dance Hall — The Bootjack Dance Hall is nestled under large oak and pecan shade trees. The 2,450 sq. ft. building has a bar, bandstand, sitting area, pool table and other game tables. The dance hall is used for weddings and receptions as well as a party venue. 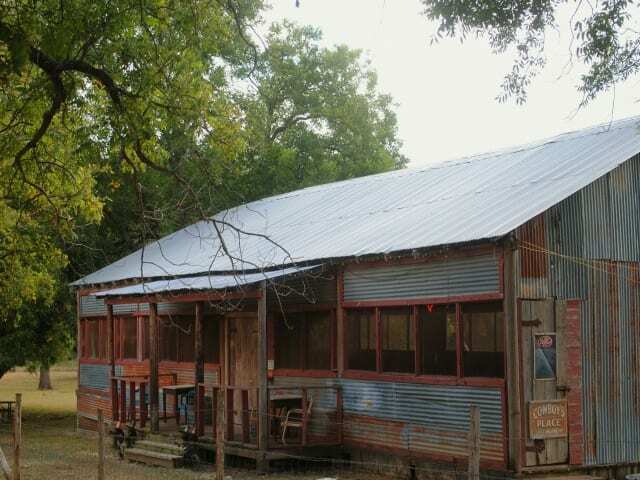 The dance hall has served as the location for the Goldthwaite Music Festival. Livestock Pens — A set of pipe pens allow you to easily load and unload livestock. High-quality amenities of this kind are typically found on legacy ranches, corporate retreats and entertainment venues. Grasses — Native grasses and a coastal bermuda field account for approximately one-third of the ranch. The grasses accommodate cattle, horses, other livestock and wildlife. Tree Cover — Approximately two-thirds of the ranch has good to heavy cover consisting of oaks, mesquite and cedar. Topography — Level grass fields, cedar and mesquite fields, rolling hills and elevated tree-covered hills overlooking Simms Creek. The varied topography creates a perfect place to ride ATVs. Wildlife — White-tail deer, dove, and turkey are found in the area. Bootjack Ranch is located within the Simms Creek — Texas Parks & Wildlife Management area. Water — Approximately 2+/- miles of Simms Creek meanders through the ranch for recreational enjoyment. There are 4 seasonal tanks for livestock and wildlife and 3 water wells, one for each house. Taxes — Approximately $7,000 a year according to the Mills County Appraisal District. The property has agricultural valuation. Showing — Please contact Peggy York, Broker at 325-938-6434 to schedule a showing of this one-of-a-kind ranch. This write-up may contain errors and omissions and is for information only. The square footage and age of structures is per the Mills County Appraisal District. The above information is subject to changes, corrections, and or withdraws from the market with no prior notice. Buyers broker needs to make initial contact and be present at first showing to receive commission.